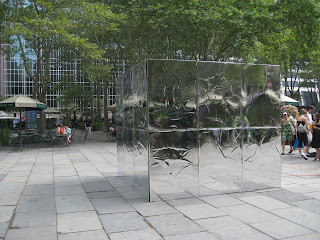 Bryant Park Blog: A Star in Bryant Park... In a Box? A Star in Bryant Park... In a Box? The hype is building for this odd, but undeniably entertaining event coming to Bryant Park. Come check out Art.Party.Theatre.Company for their encore performance in Bryant Park. You may remember them from last summer as the Bryant Park Croquet Society and this year they're back with an interactive performance called Starbox. This free performance installation will feature over 20 performers and a surprise celebrity inside a mysterious box on Bryant Park's Fountain Terrace. As audience members get the chance to line up for some face-time with the star, they are thrown into a world of flashy agents, pushy PAs, wide-eyed tourists, and star-struck fans with Bieber fever. The Starbox was set up for a brief rehearsal this morning, but don't worry, you didn't miss your chance to meet a star. No celebrities were on site for the rehearsal. Please, they are much too important for that! Come be a part of the Starbox experience on the Fountain Terrace. Fridays July 23, July 30, August 6 and August 13 from 6:30p - 8:30p! I've enjoyed everything you guys have done so far this summer - Daryl Strawberry, Kelly Cutrone, Yoga in the Park, Broadway in the Park and Dr. Ruth were some of my absolute faves. But this Starbox thing was a real joke. I feel my intelligence was insulted. Did these actors really think we believed they were real people running around like that? And then of course the end result (after some people waited for 2 hours IN THE HEAT)of "who" was in the box...pathetic. I really hope this is the last of the "Starbox" in Bryant Park. It left a real bad taste in my mouth. Thank you for your comment and I'm sorry that you had a negative experience while attending the Starbox event. The Starbox concept was created by the Art.Party.Theater.Company as a mean to reflect on the public’s curiosity for celebrities. It is not rare for experiential art to elicit varied responses from the public, and each person’s view of the art piece will be different. I hope that your next visit to the park will be more satisfying. It's fun to make fun of yourself...I mean really...isn't just curiosity to want to know who or what the mystery is... if anything it was cool to talk to people around you having a shared experience. Why not?